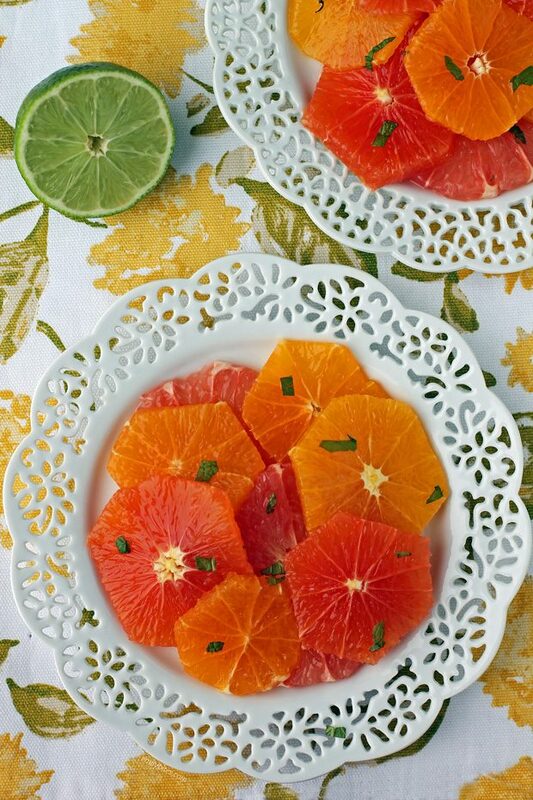 This Honey Mint Citrus Salad is so bright and refreshing, and it’s the perfect fruit salad to make in the winter! Though you can generally find citrus fruits year round, winter is truly citrus season and when the flavors are at their peak. In this salad I combined grapefruit, cara cara oranges and tangerines and tossed them in a light honey-lime dressing and sprinkled them with fresh mint, but you can definitely substitute other citrus fruits based on what you prefer or have on hand. 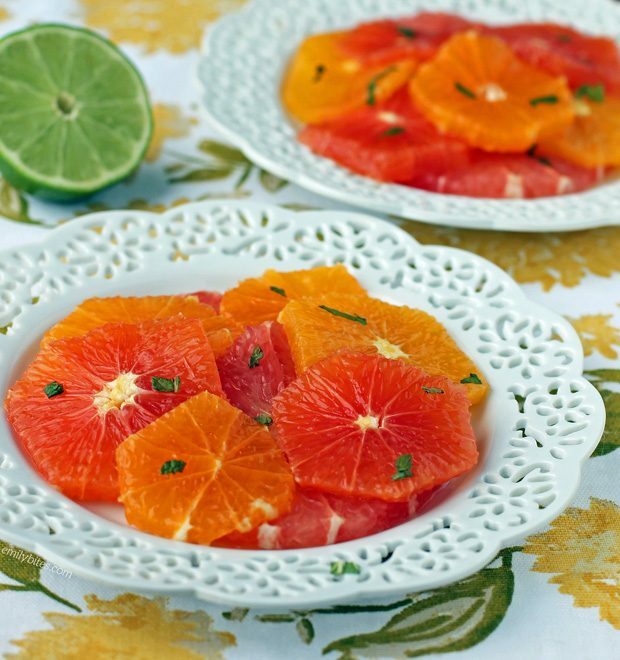 This Honey Mint Citrus Salad is perfect for breakfast, as a side dish or starter or as a fresh and healthy snack. It’s so versatile! I saw a picture of a salad like this in a magazine and it was so pretty and inspiring that I knew I wanted to make something similar for the blog. I looked around online and found lots of citrus salad recipes, but I wanted to keep this one super simple so I mostly adapted it from the versions on Rachel Cooks and Freutcake. I love the way this turned out and as an added bonus, a serving of this salad is only 132 calories or 1 Weight Watchers SmartPoints! Looking for more tasty salad recipes? Try my Roasted Beet Salad, Avocado Bacon Corn Panzanella Salad, Broccoli Salad, Taco Chicken Salad, Antipasto Salad, Butternut Squash Quinoa Salad, Harvest Apple Salad, Buffalo Chicken Pasta Salad, Greek Orzo Pasta Salad, Hummus Chicken Salad, Cheeseburger Salad, Doritos Taco Salad, Chicken Souvlaki Salad and more in the Salad section of my recipe index! 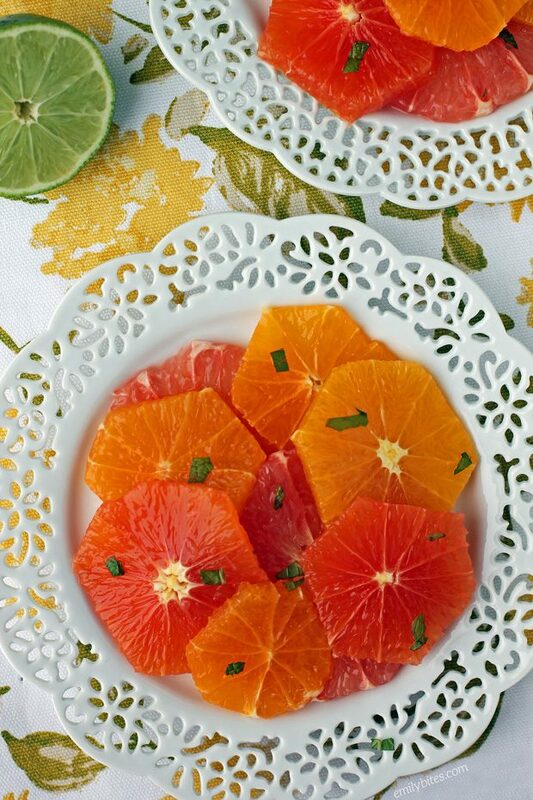 Slice the top and bottom off of each piece of citrus fruit so that they can sit flat. Use a knife to start at the top and slice downward, following the curved shape of the fruit, to remove the skin in stages, all around the edge of the fruit. Once the peel (including the white part) is removed, turn the fruit on its side and slice it. Repeat for each of the grapefruits, oranges and tangerines. Transfer the citrus slices to a mixing bowl. In a small dish, combine the lime juice and honey and whisk or stir together until well combined. Drizzle the honey-lime mixture over the citrus slices and stir or lightly toss to combine. Transfer to a serving tray or distribute onto four individual plates to serve. Sprinkle with the fresh mint.